This book began as an attempt to carry out a suggestion made in 1929 by Carl Engle in his "Views and reviews"—to fulfill his wish for "a living record of musical personalities, events, conditions, tastes... a history of music faithfully and entirely carved from contemporary accounts." Margot Fassler's Music in the Medieval West imaginatively reconstructs the repertoire of the Middle Ages by drawing on a wide range of sources. In addition to highlighting the ceremonial and dramatic functions of medieval music (both sacred and secular), she pays special attention to the exchange of musical ideas, the development of musical notation and other methods of transmission, and the role of women in musical culture. 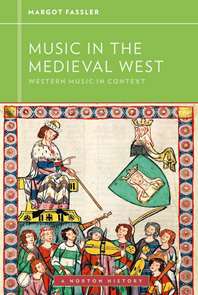 Like the other volumes in the series, Music in the Medieval West brings a fresh perspective to the study of music by emphasizing social, cultural, intellectual, and political contexts of the music. Margot Fassler looks far beyond the notes on the page or the details of composers’ lives to embrace audiences, performers, institutions, and social settings. For example, the text offers students an in-depth look at the work of musicians who, over 1,000 years ago, produced the richly ornamented chants preserved in a ninth-century manuscript from Metz in France. Along with the other volumes in the series, Music in the Medieval West is designed for maximum flexibility in the classroom. The text may be packaged with the accompanying anthology of 44 works or with Strunk’s Source Readings in Music History, all at a significant discount. The text is also available as a low-priced ebook. 8. The Thirteenth Century: "Then Truly Was the Time of Singing Come"